Stacey has always loved to travel. She spent childhood summers with family in Germany, toured all over Europe, worked in Paris and Germany, and always seems to have a bag ready to go on her next adventure. Her most recent travels include: Germany, Switzerland, Iceland, Ireland, New Zealand, Italy, France, England, and St. Lucia. After a career as a lawyer and continuing to raise her four children, she decided to follow her passion of travel to planning it for others. She is meticulous in her details and wants to provide the best experiences for her clients. She looks forward in helping her clients enjoy small getaways as well as trips of a lifetime. She was also named a Rising Star by Travel & Leisure magazine and a Trendsetter by Luxury Travel Advisor magazine. On our recent trip to New Zealand, we were scheduled to take a glacier hike. Due to bad weather, the helicopter ride was cancelled. Now, having a free day, we decided to hike up to the base of the Franz Josef Glacier. It was the most amazing hike through beautiful scenery. It was one of our favorite days of our trip to New Zealand. We never would have done this if our trip went as planned--- making lemonade out of lemons! Germany. I have so much family still living in Germany and I consider Hannover a second home to me. I also travel throughout the country visiting the beautiful small villages as well as the bustling ciities. It is a country that has so much to offer the traveler, from amazing countryside to delicious food to incredible castles. I have visited the famous Christmas markets and enjoyed the revelry of Oktoberfest. In addition, I was recently named a Signature Travel Expert for Germany. Because both my parents were born outside the U.S., and having family overseas, I was introduced to travel at a very young age. I spent my childhood summers with relatives in Germany, who took me all over the country. My parents also traveled with my brother and me all over the U.S. and Europe. In college, I worked in Paris and spent a semester in Regensburg, Germany and the Eurorail Pass provided me with the opportunity to see so much of the continent. I love learning about other cultures, seeing beautiful architecture and art, and meeting local people. This has broadened my horizons and I continue to travel to make new experiences. My children have also adopted this mindset. We are always eager to embark on our next adventure. I live by my motto of "Have bag, will travel!" © Copyright 2019. All Rights Reserved. 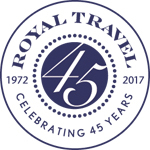 Royal Travel & Tours.